"I practice a blend of massage techniques." 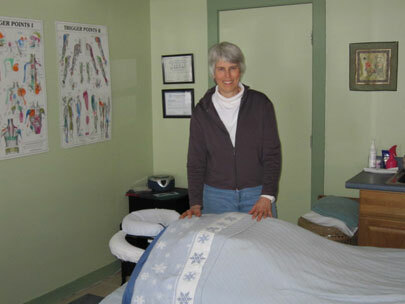 Twyla Wallace is a nationally certified, fully insured massage therapist with 30 years of experience. She was a teacher by training and then chose to shift careers and attended massage school. She got licensed in Portland Oregon in 1986. She offers massages year round in her lovely office in West Dover. Twyla loves creating individualized bodywork sessions, which nurture body, mind, and spirit. She also has extensive experience working with people who have had injuries or are dealing with chronic conditions. She always welcomes sport enthusiasts of all kinds. When requested she uses hot packs and aromatherapy and has special cushions that provide for extra comfort. Located just two miles south of Mt. Snow on Route 100 in West Dover, Vermont, Twyla's location makes it convenient for travelers or locals to call and come in for a nurturing, therapeutic massage. *When you call for rates ask about her popular package specials.